Photos by Ginny Kropf: Ruth Hedges, a member of the Lyndonville Methodist Church, shows off the sign her son Curtis Canham designed for the new clothing depot the church will open in March. LYNDONVILLE – Opening a thrift store in Lyndonville is fulfilling a vision God has for the Lyndonville United Methodist Church, pastor Olga Gonzalez said. “The first time I met with Ruth Hedges and she shared with me the vision God was giving her about a thrift store, I knew that was God’s plan for the Lyndonville community and beyond,” Gonzalez said. The church had 1,000 square feet of space in its basement which was not being utilized, and that’s where the thrift store will be located. Entrance will be on the north side of the church. Plans are shaping up and support is overwhelming for the project. They have been collecting donations of goods since last summer. They were able to get free racks and hangars from the Bon Ton in Lockport when it closed. Hedges, a member of the church, started searching for a name. “We went through a lot of names and had a lot of suggestions,” Hedges said. 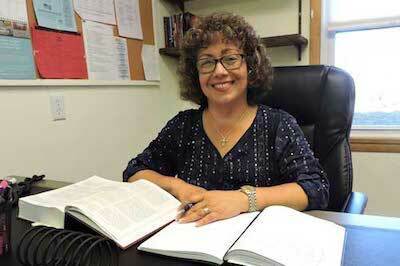 Olga Gonzalez started as pastor of the Lyndonville United Methodist Church in July. 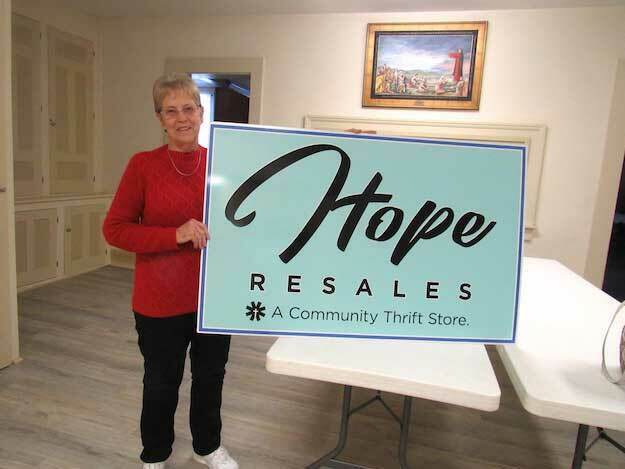 One day, recalling a verse from the Bible in Romans 12:9-13, she decided on Hope Resales: A Community Thrift Store. Her son, Curtis Canham, is a graphic designer and came up with a logo for the thrift store. The church plans to open Hope Resales on March 30. They are looking to the community for donations to stock the store. The annual winter rummage sale is scheduled from 10 a.m. to 2 p.m. Saturday, and suitable merchandise left from the sale will help to stock the thrift store. Valerie Wells, church secretary, is a lifelong resident of Lyndonville and remembers when there used to be a thrift store in Lyndonville. “But that was years ago,” she said. The church welcomes donations of good, clean clothing and household items. They cannot accommodate large appliances or furniture. Gonzalez’ wish is that Hope Resales will benefit the Lyndonville community and beyond. As a Hispanic, Puerto Rican pastor, Gonzalez also hopes to reach out to the Hispanic people in the area. “I want everyone to come and see God’s love through Hope Resales,” she said.